Hosting international guests is exciting. It gives you a great opportunity to share the things you love about America with visitors from across the globe and, occasionally, learn a little something about your guests’ homeland in the process. If you’ve never hosted international guests before, don’t fret. While there are certainly more challenges than with a domestic visitor, it’s nothing to be alarmed about. 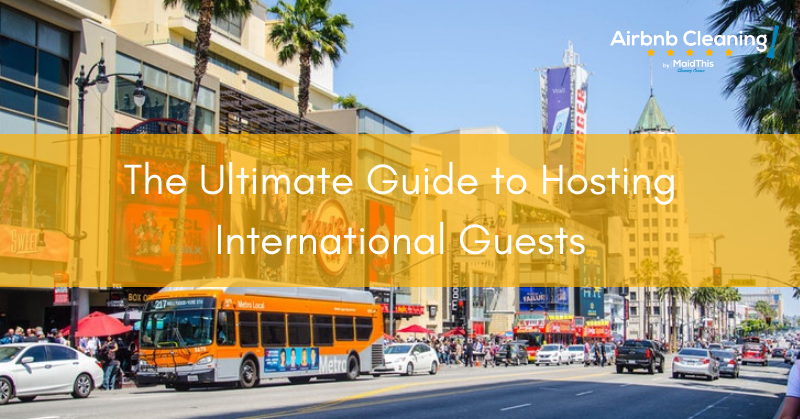 Below, we’ve outlined a few quick tips for how you can connect with your guest and give them a great American experience – no matter where they’re from. 1. Adopt a zen-like attitude. Things are likely to be a bit more challenging than what you’re used to with your other guests. Don’t let this worry you, though – rise to the challenge! Patience is a virtue, as we know, and when you’re trying to overcome a language barrier and communicate effectively, it will come in handy. If you’re not generally a very patient person, this may be a real exercise in composure and understanding. Your guests will most certainly be prepared to have a little difficulty communicating with you and navigating a foreign country, so do your best to show them the same courtesy. If you know where your guests call home, what can you do to show them that you respect their culture while also displaying some good ol’ American hospitality? Knowing a little bit about their home will surprise them and make them appreciate you as a host even more. In addition, it may give you a few clues about differences in expectations or behaviors. 3. Think about how you’re communicating with your guests. Lengthy written instructions may not be the best way to guide your guests during their stay. If you’ve got a lot going on in your welcome packet, consider simplifying some things and adding a few internationally-recognized symbols. For example, if you’ve left instructions on how to use a specific item in your home, like the washing machine, use pictures to help. If you’re not sure how to do that, play around with a Google doc or if you want to get really fancy, try your hand at Canva. There’s a learning curve to this design platform but once you get the hang of it, you’ll want to design all your host-related materials there. All that being said, it’s also smart to ensure your instructions are clear. If you’ve got specific rules that you insist not be bent, be sure you’ve made an effort to communicate those clearly. You might even go as far as using a translation tool to ensure your note is written in your guests’ first language. There’s something to be said about going above and beyond for guests. Not only do they appreciate it, but they’re more likely to leave stellar reviews. And honestly, let’s be real: Who doesn’t love it when someone does something extra special or nice for us? This can easily tie hand-in-hand with our point above about doing your homework. Consider leaving a few of your favorite thoroughly-American snacks or drinks in the kitchen for your guests to try. Have a favorite local shop you like to frequent? Pick up one or two things to share with your guests that they might not otherwise know about or seek out. This is a great opportunity for you to really show off a few local gems and elevate yourself as a helpful host. Hosting international guests does, at times, have its challenges but it’s also an experience you will appreciate for years to come. Get excited, get ready, and get going! Your guests will appreciate the thought you put into their stay.